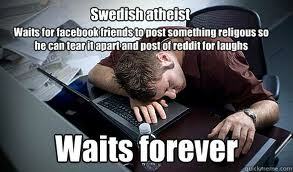 This is a follow-up to two posts that I completed in January 2012 on my Atheism. I was amazed (not to mention flattered) by this news. The world is small, and the Internet makes this world smaller. Next month, I will celebrate two years as a blogger, and in all this time I’ve never had such a popular post. I never expected it to get beyond my close circle of friends and family, but it most certainly did, and months later, I’ve only seen hits to this post increase. So why was this post so popular? I cannot answer for those readers who have visited my site (and I thank you all), but for me, it is important to hear rational voices in stark contrast to the talking heads we see so often in American media. Whether the issue is religion, politics, or alien visitors, the media presents it as if all sides are equally valid. Of course, not all sides are equally valid, and as such the media is doing a great disservice to the public. Comedian Jon Stewart calls it a “Bias toward sensationalism and laziness.” Indeed, it is far easier for a cable news program to put two experts on opposite ends of the spectrum on the screen and let them shout over each other for a few minutes than it is to actually report on a given subject. Often, this push for sensationalism will go to great lengths to diminish scientific fact. For example, I remember catching an episode of Larry King Live (click link for full episode) a few years back wherein Michael Shermer was the only person among four panelists demanding scientific evidence for the outlandish claim that aliens had visited our world. The other three “experts” were spouting off conspiracy theories and snidely referring to Shermer as a “debunker.” (To which, I’m sure, Shermer would insist that there was a lot of bunk). By portraying these two sides as near-equals, it serves to create confusion in the minds of those who are not properly educated on the subject. 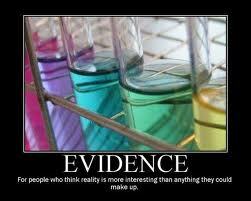 The same could be said about any number of political, scientific, or religious matters. Unlike scientific debates, which incorporate new facts to create a general consensus of the natural workings of the universe, these televised debates lead to more polarization, not less. In the U.S., there are now two sets of facts about every topic imaginable. Global warming is real and a fraud. Tax cuts lead to greater debts and deficits and they reduce debts and deficits. Government spending creates jobs and fails to create jobs. It is ironic that by giving more time to public debate, we are not resolving these differences, but only widening them. The fact that global warming is a political issue and not a scientific one, shows how polarized we have become. As a result, blogs like mine become a place where like-minded individuals feel safe. In a way, I feel guilty about this fact. I don’t want to play to one segment of the population, I want atheists and theists, liberals and conservatives to feel like they can read my blog and comment without fear of reprisal. That said, it is impossible for me to comment on an issue without giving the facts–the cold, hard, scientific facts (so far as they can be known). If we’re being honest about facts, we cannot say that any religion has a basis in reality. And yet, to question any of the miracles alleged to have happened by mainstream religions, agnostics, atheists, and skeptics alike are ridiculed and criticized. We seek evidence of these seemingly impossible events, and in return we are told that we “don’t get it” and that the supernatural world is beyond our understanding. To the scientifically-minded, like myself, this attitude is unacceptable. The natural world has provided us with the answers that we seek, so long as we are asking the right questions. It turns out that the universe is far more amazing than any of the religious narratives proffered thus far. From the tiniest quantum fluctuations to the structure of the entire universe, we live in a bizarre and wonderful reality. It is a reality that is not fully understood, and may never be, but it is also one that does not need an element of the supernatural so far as we know. Some have pointed out that posts like these are beyond the purview of my modest travel-based blog. I disagree. In my travels, as well as in my writing, I try to push the boundaries. While pointing out that we have no idea about God or gods doesn’t seem that radical to me, it still is a radical idea to many Americans. Radical, and some would claim dangerous. To call myself an atheist I had to overcome the negative connotations that have been drilled into my head by society my whole life. This is the reason why “coming out” as an atheist is a big deal: because we need more voices to push back against the forces of irrationality and unreason. We need to show that “atheist” is not a scary word, but a liberating one. And we need to push to free more minds from the bounds of narrow, unenlightened, religious thinking.